On February 19, 1945, 30,000 US Marines landed on the Japanese held island of Iwo Jima, part of the Volcano Islands chain. The Battle of Iwo Jima is often cited as the most ferocious battle in American History and is a testament to the incredibly brave and dedicated men on both sides that fought and died there. Among the bravest of the brave was Gunnery Sergeant John Basilone, a previous Medal of Honor winner from the Guadalcanal Campaign that was only at Iwo Jima because he demanded to be returned to action instead of staying in the mainland United States selling War Bonds. He died on the first day of fighting on Iwo Jima, once again proving his courage and ferocity under fire. His death was an exclamation point on the horrible fighting that was Iwo Jima. The United States Marine Corps has a long history of brave men under fire, including but not limited to Smedley Butler, Lewis B. “Chesty” Puller, Gregory “Pappy” Boyington, Presley O’Bannon, John Glenn, and a host of others, but John Basilone sticks out for his sacrifice at Iwo Jima when he could well have been safe in the States. Born In Buffalo, New York in 1916, to parents of Italian heritage, his family moved to New Jersey in 1918. John went to Catholic Parochial school until the age of 15 when he dropped out of school before starting high school. He worked as a golf caddy until joining the United States Army in 1934, not even 18 years old. John’s Army time included service in the Philippines, where he excelled as a champion boxer. After his discharge from the Army in 1937, he worked as a truck driver but the call of the Philippines was strong, and John enlisted in the US Marine Corps in 1940, figuring the Corps would be his fastest ticket back to the Philippines. Like many military enlistees, Basilone found out the hard way that you do not always get to pick your duty station! He was sent to Guantanamo Bay, Cuba where he served until the US entered World War II and John became part of the Marine landing force at Guadalcanal in the Solomon Islands in 1942. At Guadalcanal in October of 1942, Basilone was nearly 26 years old and had his Army time and a couple of years in the Marines, making him one of the more seasoned NCO’s. In command of 2 machine gun sections, the sector assigned to John’s guns came under heavy and direct attack from fanatical Japanese making a determined attack against the greatly outnumbered Marines. Basilone skillfully used his machine guns until the only Marines still standing were himself and 2 others. Cut off from the other Marines, Basilone would not relinquish his position, and retrieved another machine gun to add to the fight. Then he field repaired yet another gun, and when the machine gun ammo ran out, he ran around the battlefield under fire to personally gather more ammunition for his guns. 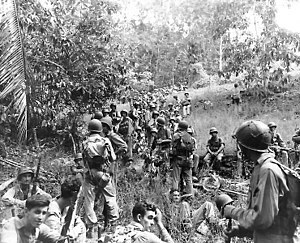 When even that ammunition ran out, Basilone fought with his pistol and a machete, killing many Japanese at close range and keeping his outpost under incredible odds, virtually destroying the Japanese attacking force of about 3000 men. For this action, John Basilone earned the Medal of Honor, the highest award for bravery in combat an American military person can earn. Now a major American hero, Basilone was used like many other American military heroes as a shill for selling War Bonds. He quickly tired of the life in the limelight and requested to return to front line duty. The Marine Corps refused, saying he was more valuable in the States selling War Bonds. Eventually his pleas were answered, and he was transferred to Camp Pendleton, California, for training and integration into a combat command. Meanwhile, Basilone had turned down an offer to be made an officer, preferring to stay in the familiar ranks of being a non-commissioned officer. 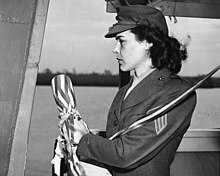 While at Camp Pendleton, John met and married Lena Mae Riggi, a Sergeant in the Marine Corps Women’s Reserve on July 10, 1944. In February of 1945, GYSGT John Basilone was back in the Pacific with the 5th Marine Division, part of the invasion force for the invasion of Iwo Jima, known by the military codename Operation Detachment. Once again, Basilone would be leading Marines in combat with the Japanese as a machine gun section leader. As the Marines tried to advance under withering fire from Japanese fortified positions anchored by concrete blockhouses containing machine guns, Basilone personally ran up the flanks of the blockhouses to get on top and lob in grenades and demolition charges to destroy the Japanese positions. Basilone managed to single handedly kill the Japanese defenders and destroy the fortifications. Fighting their way inland toward the airfield, Basilone led his Marines against heavy Japanese fire. Seeing an American tank stuck in a minefield, Basilone personally led the tank to safety despite being under heavy machine gun and mortar fire. After leading the tank to safety, John Basilone was struck and killed by projectiles in the neck, groin, and arm, killing him instantly. Officially he had been killed by mortar fragments, but later analysis indicated he may have been struck with machine gun bullets. Either way, the great American hero was dead, one of over 6800 Americans that died in the battle for the little island. John Basilone was awarded the Navy Cross for his heroism at Iwo Jima, the second highest award for bravery in combat a Marine can earn. He was buried at Arlington National Cemetery, and his widow never remarried, eventually dying in 1999. John Basilone is remembered by having numerous streets and military locations named in his honor, and 2 US Navy destroyers have carried his name. He is remembered as one of the greatest of the many US Marine Corps heroes. Semper fi, John. Question for Students (or others): Who is your favorite famous US Marine? Which Heavyweight Boxing Champions were former US Marines? Proser, Jim and Jerry Cutter. I’m Staying with My Boys: The Heroic Life of Sgt. 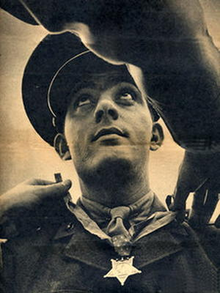 John Basilone, USMC. St Martins, 2010. Ross, Bill. Iwo Jima: Legacy of Valor. Vanguard Press, 1984. Tatum, Chuck. Red Blood, Black Sand: Fighting Alongside John Basilone from Boot Camp to Iwo Jima. Berkley, 2012. The featured image in this article, a photograph by Something Original at English Wikipedia of the headstone for John Basilone in Arlington National Cemetery (Section 12, Site 384), is licensed under the Creative Commons Attribution-Share Alike 3.0 Unported license.